The Flavor Team seeks out wine-related experiences whenever we travel. Winery Wanderings shares our adventures to wineries beyond the California Central Coast. 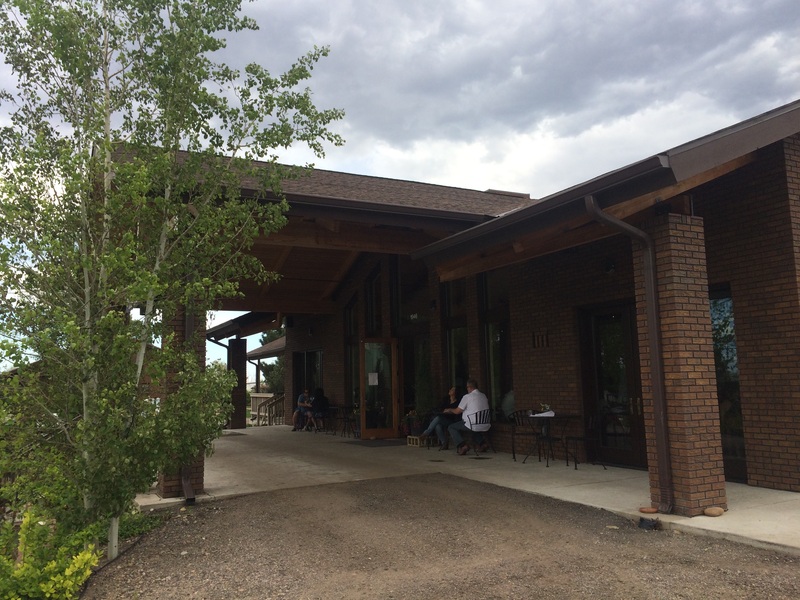 Tucked away in an unpretentious North Denver neighborhood lies a little gem: Balistreri Vineyards. Balistreri’s Vineyards welcomes Colorado wine enthusiasts to experience their Sicilian winemaking traditions with a modern touch. Surrounded by industrial properties, the oasis built by the Balistreri family starting in the 1900s includes its winery, tasting room, restaurant, outdoor garden, and event facility. A few years ago, and right before I moved to the Central Coast of California, a friend of mine (John & Linda) talked about a wine club in Denver that he and his wife belonged to. He described the great wine, the family run winery, and the fun events that they enjoyed attending throughout the year. It sounded fun, but at that time, I didn’t know much about wine and hadn’t developed an appreciation for winemaking, so I filed the information away. 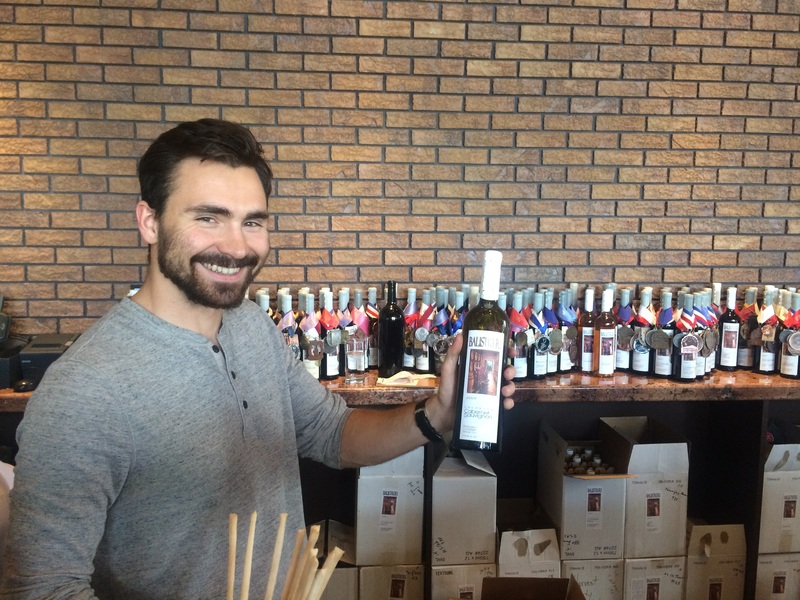 With wine now much more a focus for me, on a recent trip to Denver, I knew I wanted to experience the winery my friends enjoyed so much. I decided to check out Balistreri Vineyards myself—and I’m glad I did! When I loaded my maps app to get directions to the winery and tasting room, I was not sure it was working correctly. It pointed to an area in the Commerce City area north of Denver, which, like its name, was primarily a commercial and industrial area. Not quite the location you’d imagine for a nice winery. But like anything good in life, initial impressions can be deceiving. My parents also enjoy wine, so I invited them and my sister to join me. As we approached the building, there were a lot of cars—a good sign, I thought. We parked in the back lot and made our way through the garden entrance. The back garden area is home to Balistreri’s annual summer wine and movie night each July. I learned later that this large lawn area is where they have their annual summer wine and Italian movie night, which my friends had mentioned several times as great fun. Interesting side note: Flavor Team member Kara actually went to a couple of those wine and movie nights when she lived in Colorado, and confirmed how much fun they were! Before the Italian movie started (sometimes the movie had subtitles, sometimes it did not), guests enjoyed wood-fired pizzas, antipasto selections, desserts, and of course Balistreri wines. During the movie, people enjoyed more Balistreri wines and truffle popcorn. This year’s movie night is on July 22 and will feature the director’s cut of Cinema Paradiso. And now back to the story of my visit. 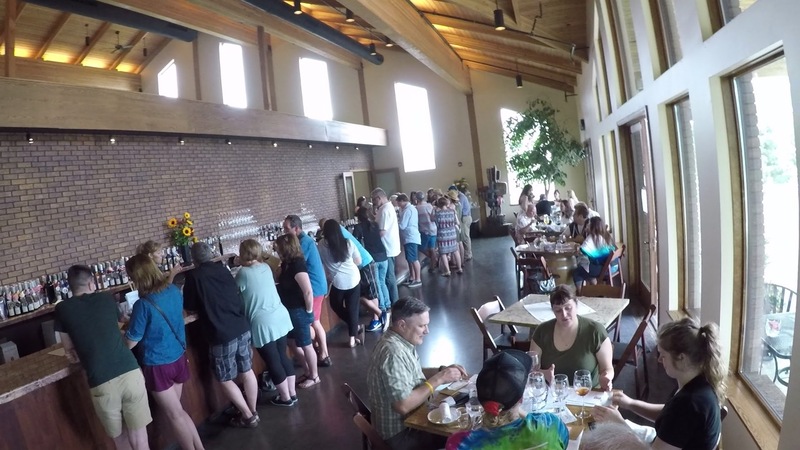 As we made our way into the large and pleasant tasting room, the staff greeted us and said that there were no tasting fees for parties of up to eight people. What? No tasting fees?! Crazy, right? Nope, a great excuse to see what we liked and pick up a bottle (or more) to take home. At least in my experience, this approach is pretty rare for wineries out here in the Central Coast of California, and if done right, I think it could be an interesting tasting-room model. The spacious tasting room and tables to enjoy lunch with wine. And no tasting fees for parties up to eight people. Before we started our wine tasting with Balistreri, we decided to have lunch. It was amazing, and it earned every great reviews it’s garnered. And while the quality is high, the prices are very reasonable. Do allow time to enjoy lunch when you visit. You will not be sorry! The food was an experience in itself. I was happily surprised at the quality, and the overall presentation really hit it home with my family and me. I tried the Pan Roasted Bistro Filet. It was cooked to perfection, on the rare side, and was topped with morel demi-glace sauce which brought out the taste of the meat without overshadowing the simple elegance of the meat itself. Rhubarb tart in chocolate shell. Delish. It came with potato pave which reminded me of scalloped potatoes and paired well with the meal. My mom had the Roasted Half-Chicken, which was a pretty good size and again cooked well, leaving in a lot of that flavorful juice so it stayed tender and moist. The skin was encrusted with herbs, and paired with an amazing sauce with mild fruity and spicy flavors. I was full at the end of our meal, but when I saw the single Pistachio Cannoli, of course I had to try it, for the benefit of our Great Flavors community. BAM! It was an amazing little desert. This is must try when you visit! 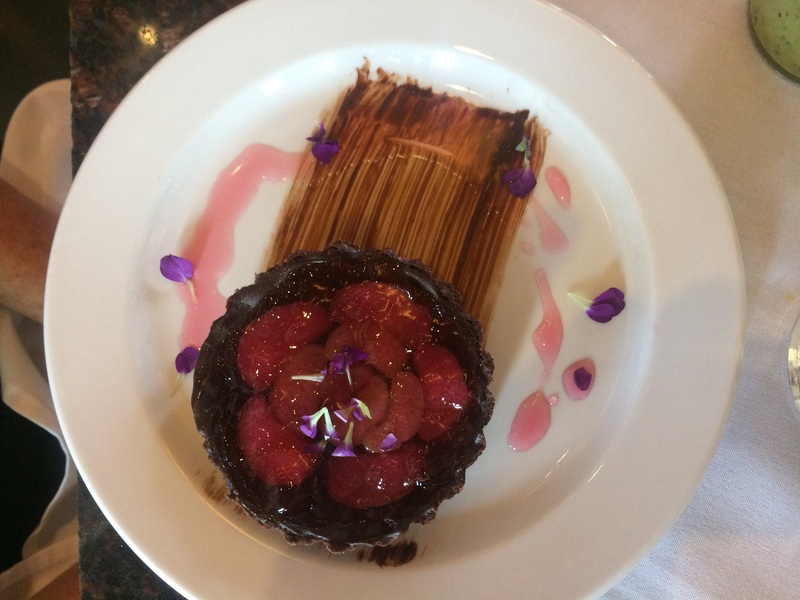 They also had a rhubarb tart in a chocolate shell, which was the perfect combo of tart and sweet, and beautifully presented. Feeling great from our wonderful lunch, we made our way to the tasting room. Ray Balestreri, grandson of founder and winemaker John Balestreri, is a great host as he pours our tastings and shares the Balestreri story. There, grandson Ray Balistreri poured us tastings from a long list, which included four whites, 11 reds, and three dessert wines. We were ready to begin and learn more about the Balistreri family as we learned about their wines. Winemaker John Balistreri’s family emigrated from Sicily to the United States in the early 1900s and made their way to Colorado, where they worked as “truck farmers” producing local vegetables in the North Denver community. Wine, of course, was part of the family and Sicilian traditions and winemaking methods were passed down to the next generation. From the family’s early agricultural roots, John Balistreri transitioned the family farmland to greenhouses for growing carnations in the early 1960s. John continued the Sicilian tradition of producing wine for family and friends, and in 1998, with the efforts of John’s daughter Julie and wife Birdie, Balistreri Vineyards was born as a commercial endeavor. Starting first with a modest tasting room where they could showcase and share their authentic and natural style of wine making, the business has grown to include a wine cellar, large tasting room, restaurant, event center, and outdoor garden and patio space. The U.S. Navy asked Balistreri to make a sparkling wine to christen the USS Colorado. As Ray poured our first white wine—a 2016 Colorado Riesling—we noted the lovely orange hue and he explained the natural winemaking methods they use. Balistreri wine labels denote grape origin: American is California-sourced grapes, and Colorado is (wait for it) Colorado-sourced grapes. Whether red or white, all grapes are handpicked from select vineyards primarily in Colorado, and a few in California. (The labels indicate the grape origin by stating Colorado (grapes from Palisade on the western slope of Colorado) or American (grapes from California vineyards). After crushing, the wines are allowed to ferment using indigenous yeasts, and Balistreri uses the sur lie method. 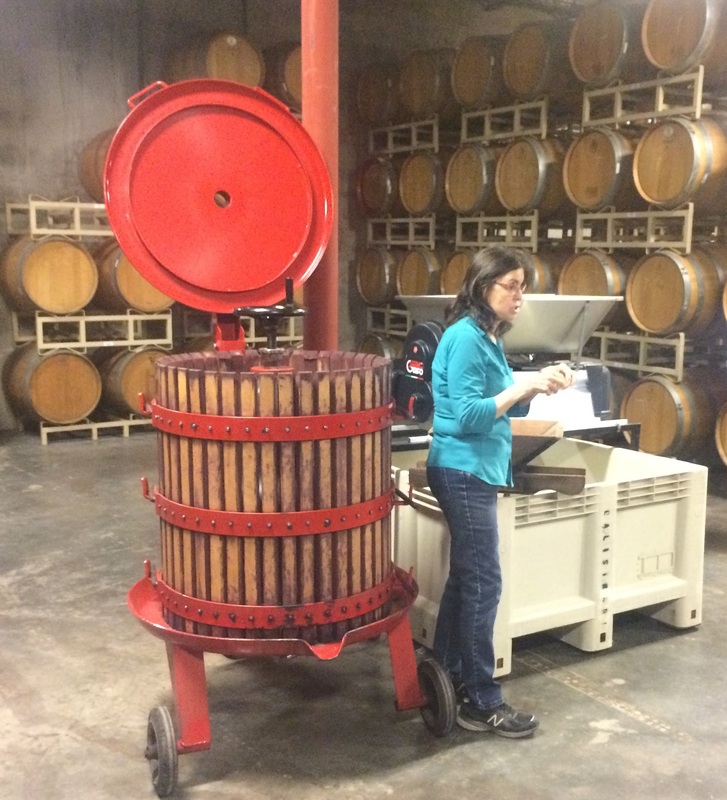 The wines age in American Oak barrels for approximately one year, where they undergo natural malolactic fermentation, and white wines do not receive cold stabilization. “We ferment our white wines on the skins, like red wines, which gives them this deep color and flavor,” explained Ray. I felt this left a slight tannin feel and added a nice element to their white wines. Winemaker John mentioned that their style of white wine is best served around 55 degrees—not too cold. This allows the deeper flavors to come out. In addition to the Colorado Riesling, we tasted a Colorado Chardonnay and Orange Muscat. ● 2016 Colorado Riesling. Sight: Light orange/yellow. Smell: Orange and very subtle honey. Taste: nice orange flavor just balanced with a little acid. As Ray began pouring a few of their red wines, he mentioned that they make about 6,000 cases a year. 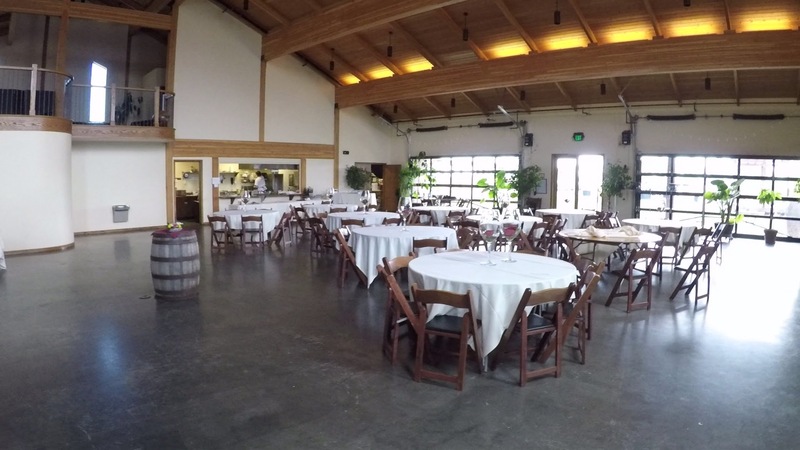 The open and airy event center holds parties, weddings, and seating for guests at various winery events. “None of our wines are filtered or fined, and instead we bottle one barrel at a time, without racking,” he said. This can result in natural sediment, which is easily addressed by careful pouring or decanting. ● 2015 American GSM; “A beautiful rendition of a classic Rhone blend.” Second vintage. The notes said creamy vanilla and toasted oak to the nose. I tried multiple times and did not smell oak. Sight: Light to mid-red. Nose: prune and vegital. Taste: light cherry, chalky minerality (riverstone? ), and a very long finish (which was good). This reminded me of the French “classic” wines from our European wine class, with the vegital notes. This was pretty good and would be a good with a nice meal. 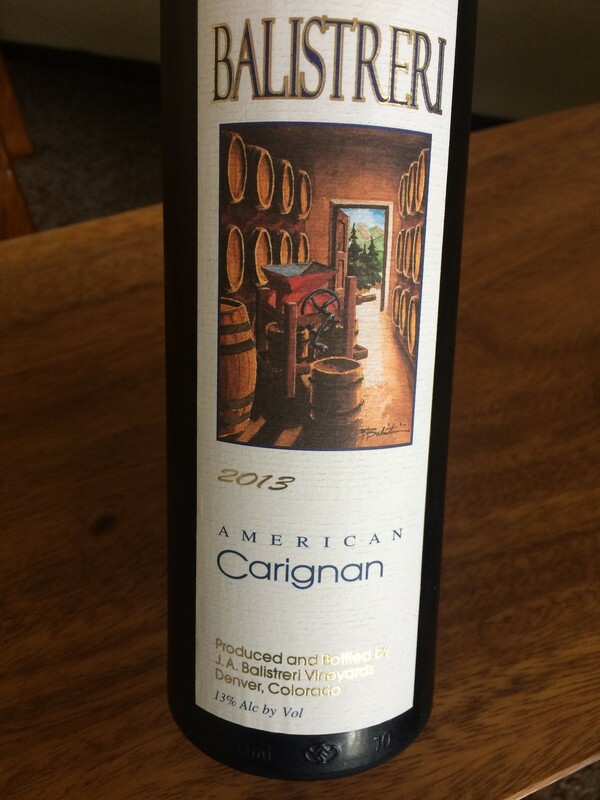 ● 2015 Colorado Tempranillo. Sight: mid red/purple tones. Nose: blackberry/black licorice (currant?). Taste: mild acid, and mid to heavy tannins. The nose was really nice and the tastes came out well from that. I think this would do well for aging for balance! We also tasted its 2012 counterpart and it was much better balanced. Taste: blackberry, spice, chalky/minerality, good structure. Recommend to get the 2015 and let sit a few years. ● 2014 Brothers Cabernet Sauvignon. Sight: mid /light red (light for a cab!). Nose: cherry/prune with some herbal tones. Taste: balanced cherry & prune with some (light) minerality. Overall this was a nice version of their Cab. ● 2014 American Petite Sirah. Sight: dark red/purple. Nose: blackberry, little minerality, and some subtle spice. Taste: ripe berries (black) and strong tannins. Would go great with meat dishes or heavy sauces. Other current Balistreri red wines include: 2015 Colorado Sangiovese, 2015 Colorado Zinfandel, 2015 Colorado Cabernet Franc, 2015 Colorado Little Feet Merlot, 2015 Colorado Syrah, 2015 Colorado Syrah, 2015 Colorado Cabernet Sauvignon. Dessert wines included Balistreri Port, 2015 Late Harvest Zinfandel, Colorado Cherry. Birdie Balestreri gives a tour of the winery. After our tasting, Birdie gave us a tour of the winery. We had the chance to also talk to John a bit, and explained that his winemaking approach combines his traditional Sicilian methods with modern technology to produce award winning wines that are handcrafted, one barrel at a time, fermented on their own yeast, unfiltered and unaltered by sulfites. Even each bottle’s trademark waxed neck is done by hand. There is a lot of pride at Balistreri Vineyards, and it shows in the details. From the well-kept grounds to the superb restaurant and the high-quality wines, each element shares its common foundation of the Balistreri family’s focus on sharing the best with family and friends. 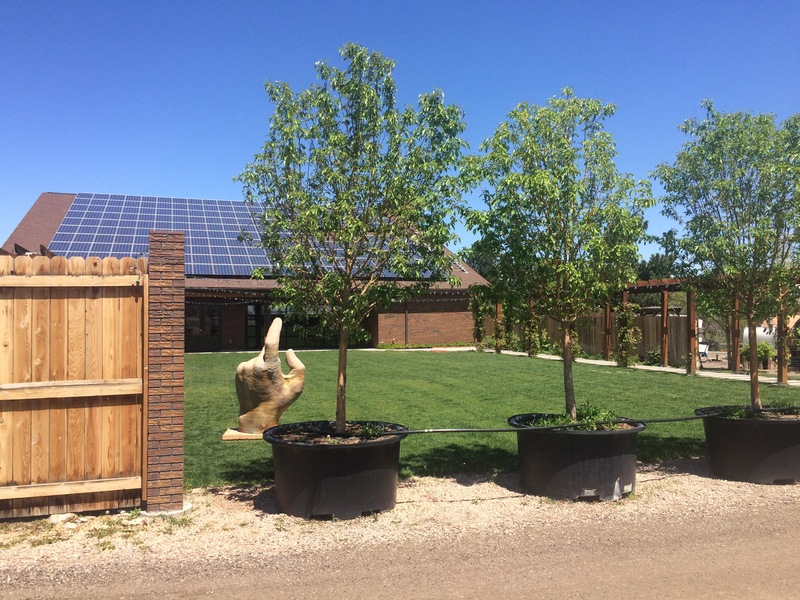 If you’re in Denver, make a point to take the quick drive to Balistreri Vineyards and spend a few hours enjoying the ambiance of this gem. You’ll be glad you did. The Winery is open for wine tasting, winery tours, and lunch every day from 11:00 am to 5:00 pm.